Hurricane season is here – Should we prune our trees? This is a repeat of a previous article on hurricanes and tree pruning, but the information bears repeating as we head into hurricane season. Tree companies are out and about offering to prune large trees and palms for hurricane season. Much of the pruning that is done by these roaming "tree surgeons" can actually create a tree in more danger of failing in high winds than providing protection. There is a lot of research conducted by the University of Florida on the proper way to prune trees and the way that trees behave in high winds. The green leaves on trees and the green fronds on palms are the source of the food that these plants need to thrive and grow through the process of photosynthesis. When you remove green leaves and fronds, you reduce the ability of the plant to produce the food necessary to support the roots and top growth adequately. the palm is weakened. And, when all but a few of the fronds are removed in what is commonly called "hurricane pruning", the trees is in more danger of failing in high wind. The lower, fronds are mature, hardened fronds that protect the newer, more fragile fronds near the growing bud of the palm. Without the mature fronds for protection, the top of the palm is more likely to sustain wind damage during hurricanes or other high wind events. In addition, when this type of pruning is continued over time, the palm is weakened and may develop nutrient deficiencies and eventually decline and die. According to Dr. Ed Gilman of the University of Florida, palms are pruned primarily for people reasons and not the health of the palm. It is perfectly acceptable to remove dead fronds, blooms and fruit. And, I find that when a frond is hanging too low over the sidewalk, just cutting off the tip end of the frond will make it light enough to spring up out of the way of pedestrians. Removing the frond bases that remain attached to the trunk with a chainsaw creates wounds where insects or disease can enter and is not a good practice. In addition, several fatal palm diseases can be carried from palm to palm by pruning tools that have not been cleaned properly. 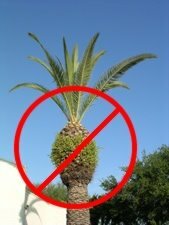 Ask anyone pruning your palms to clean their tools with diluted bleach or 70% alcohol before pruning in your landscape and in between each palm pruned while in your yard. many or all interior low branches is considered over-thinning or "lions-tailing". Dr. Gilman states that "When people prune trees in this abusive manner, excessive live tissue is removed from the tree and no structural pruning is performed. This creates poor form and numerous wounds, and the tree becomes more prone to failure especially if there are few trees nearby. Old trees can decline as a result of removing too much of the leaf canopy. The best practice is to remove no more than ten percent of the live foliage on mature trees." Reducing the amount of foliage on the ends of the branches, and thus the weight, is a better practice to reduce risk of branch and tree failure during high winds. The canopy can be opened up without removing all of the interior branches and attached foliage. An arborist certified by the International Society for Arboriculture is trained in the proper way to prune and protect trees. However, all certified arborists are not equal. When requesting a quote from an arborist, ask to see their ISA certification card, proof of liability insurance (ask for this no matter who you hire), references, and also ask if they will be with their crew when the work is done. You might even go to look at some trees that they have pruned. You can find certified arborists in our area on the Internet at: http://www.treesaregood.org/findtreeservices/TCSHome.aspx. Trees add considerably to property value and keeping them healthy while providing protection from damage is a delicate balance that requires planning and caution. Please do your homework before allowing just anyone with a truck and a chain saw access to your trees. Master Gardeners are available to help with your plant or landscape questions at the Palm Harbor Library each Wednesday from 10 a.m. until 2 p.m. This is a free service of Pinellas County Extension and the University of Florida.